We chart a southerly course for Antarctica. This stretch of the South Atlantic is rich in its bio-diversity and showcases an abundance of wildlife. We will be joined by hundreds of seabirds including the wandering albatross. Giant petrels and smaller Cape petrels are also constant companions as make our way south. Photographing these magnificent birds from the deck of the ship takes patience and skill and our photography expert will be on hand to show you the best techniques. Join the ship’s Captain on the bridge and learn about the operations of our modern research vessel. Throughout the day our onboard experts educate us with a series of presentations about the environment, the wildlife and history and the locations we hope to visit in the coming days. As we approach the coastline of Antarctica, we anticipate an increase in whale sightings. We awaken today and the magnificent snowy peaks of continental Antarctica are laid out before us. Even our experienced expedition staff, some with more than 100 journeys south, will take a moment to pause and reflect on the immense power of Antarctica. Take a deep breath – you have arrived. The waterways of the Antarctic Peninsula are home to deep bays, pristine coves and inlets and numerous islands. The landscape features heavily glaciated mountains permanently covered in ice and snow. Rocky outcrops, known as ‘nunataks’ are home to gentoo, Adelie and chinstrap penguin rookeries and the waters are rich in marine life. We frequently encounter seals, including the powerful leopard seal, often found relaxing on an ice floe. Curious humpback whales and the smaller minke whales are found in sizeable numbers in this region. Sightings of orca are not uncommon. Fournier Bay is a known whale ‘hot-spot’ and ice permitting, we explore in Zodiacs hoping to encounter pods of whales. The science team hope to deploy non-invasive tracking devices on the whales to collect data on dive and feeding patterns. Observation and photography of whale flukes (tails) is something everyone is encouraged to participate in both from the ship and while Zodiac cruising. Whale flukes are unique identifiers of particular animals, in much the same way as a human finger print. Collecting and analyzing this data is vital to our understanding of whale migration patterns and social behavior. In addition to our whale encounters, we enjoy a regular program of exploration on and off the ship. Popular activities include guided hikes on shore and visits to wildlife colonies with our expert naturalist guides, while the historic huts and science stations provide a fascinating glimpse into the past and the present. Zodiac cruising among the ice is a memorable activity and our sea kayakers may range several miles from the ship. Our photography guide will be on hand to help you with your camera handling, image composition and the peculiar light found in Antarctica. Planned excursions could include Cierva Cove, Danco Island, or a cruise through the Errera Channel to visit the penguin rookeries at Cuverville Island. Wilhelmina Bay never disappoints and is another important location where the scientists hope to deploy their research tools. Neko Harbour is yet another highlight and offers an excellent hiking route providing stunning 360 degree views. After several busy days of exploration along the Peninsula, we head north across the Bransfield Strait, bound for the South Shetland Islands. This is an important whale migration corridor and frequent sightings can be expected of humpbacks and even the fast moving orca. By morning we arrive in the South Shetland Islands. The adventure is not over and if the weather conditions allow, we sail the ship into the flooded volcanic caldera at Deception Island. This is a very dramatic place and history is all around us as we explore the old whaling station, with the rusted old boilers and dilapidated wooden huts. At the far end of the beach is an old aircraft hangar. This is where Australian, Sir Hubert Wilkins made the very first flight in Antarctica in 1928. There is also an outstanding hike, high up onto the rim of the crater. After leaving Deception Island, we cruise along the coast of Livingston Island which on a sunny day is a memorable experience. There are several other landing sites in the South Shetland's including Half Moon Island, or the broad pebbly beach at Yankee Harbour, where we sometimes encounter Weddell seals sunning themselves. This is another great spot for a hike or a zodiac cruise. Hannah Point, with it's elephant seal colony and nesting Antarctic petrels - is another possibility. In the evening, we navigate north through the McFarlane Strait and into the Drake Passage, charting a course for South America. Specific sites visited will depend on ice and weather conditions, the planned itinerary will be updated at the time of final preparations as well as throughout the voyage in order to take advantage of favourable conditions. 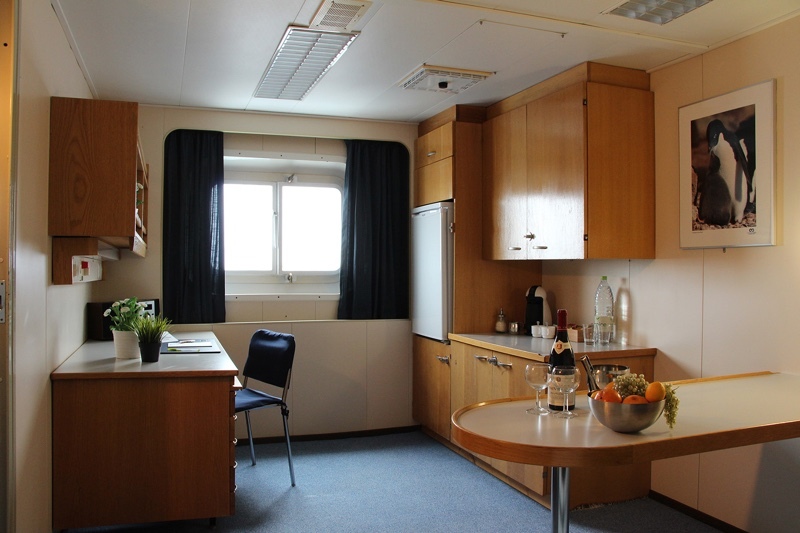 The Akademik Sergey Vavilov is modern, comfortable, safe and ice strengthened. 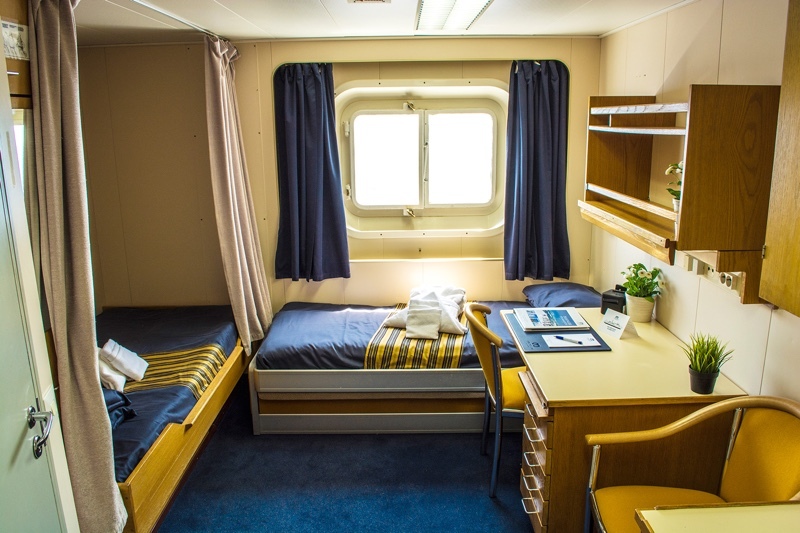 From small group sessions to briefings for all passengers, we have public spaces onboard the ship ideally suited for each and every need. A separate lounge and bar with panoramic views, as well as a library provide ideal places to sit and relax or catch up on some reading. A selection of movies and documentaries can also be watched in the lounge. 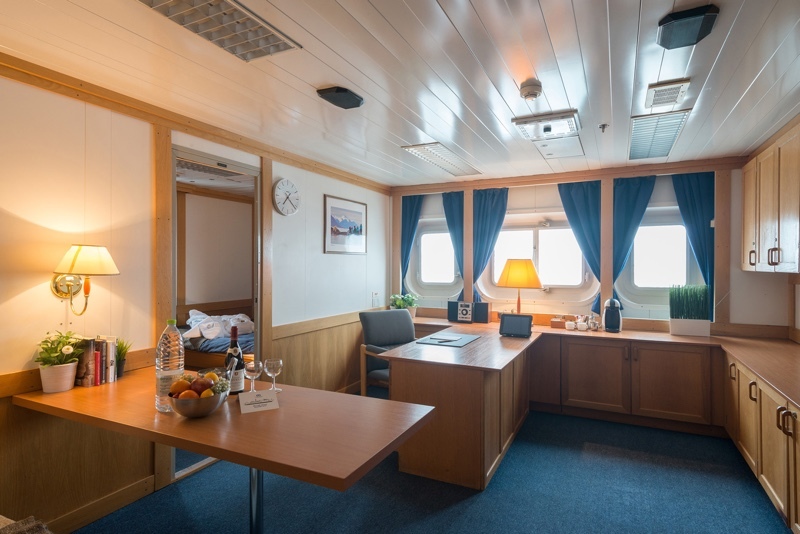 The sumptuous meals prepared for you by our culinary team are enjoyed in our dining room, which can host all passengers in a single seating and will keep you feeling healthy and strong for the myriad of activities offered throughout the voyage.